Professor Kyong-mi Paek of Division of General Studies at UNIST. "Dynamic Growth in Contemporary Art and Creative Practitioners for the Future" by Professor Kyong-Mi Paek of General Studies. 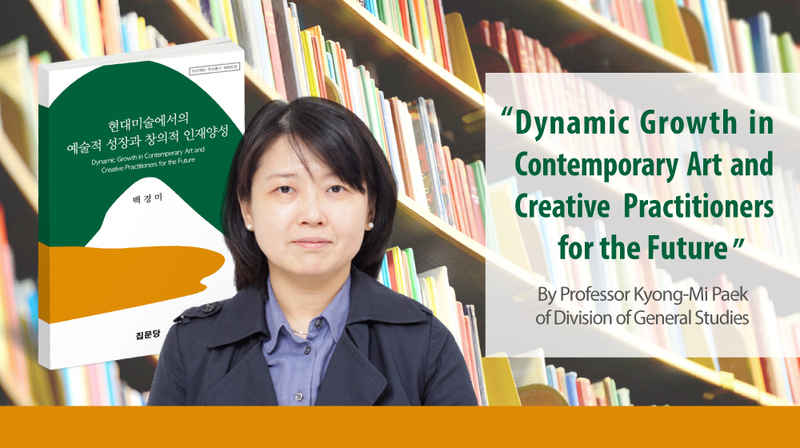 Kyong-Mi Paek, professor of Division of General Studies at UNIST has recently published her new work,”Dynamic Growth in Contemporary Art and Creative Practitioners for the Future”. This book, published by Jipmoondang Publishing Co., Ltd., provides new insights into the dynamism and complexity of the contemporary art scene in South Korea. The book consists of four chapters that cover the following topics: Arts and the development of humanity, Korean contemporary arts after 1990s, an introduction to five Korean contemporary artists, and implications for fostering creative talents. This book is the result Professor Paek’s recent research support project in humanities and social sciences, funded by Asan Foundations in 2012. After a brief introduction, addressing the recent movements in Korean contemporary art, the book explores the new reality of the Korean contemporary art after 1990s. The book also offers a basic introduction to the work of five of the country’s prolific contemporary artists and their work. This work of Professor Paek has been recognized as having potential to contribute to the future of arts education and is now included in 2016 Asan Foundation Research Monograph. Professor Kyong-Mi Paek joined the faculty of UNIST in 2009, as an Associate Professor with research and teaching focus in contemporary arts, creative practices, and visual literacy. Prior to joining UNIST, Professor Park has also held full-time research position at the Educational Research Institute of Ewha Womans University and the Seoul Foundation for Arts and Culture. Professor Paek obtained a Bachelor of Arts degree in metal art and design and a Master of Fine Arts in interior design from Hong-ik University, Seoul, South Korea. She received her Ph.D in Art Education from the Teachers College, Columbia University, New York, United States in 2007. Professor Paek has published more than 20 publications that are regarded as the highly cited papers. She is also a co-translator of Richard Hickman’s Why We Make Art And Why It Is Taught.